So once again the warm weather of summer is upon us. It is the season where the bikinis are out, people are wearing less, and people want to show off their bodies a little more. People especially want to show off their “beach” muscles. While the abdominals are probably the number one beach muscles, the biceps probably come in as a very close second. While your abs are controlled by the extent of your diet and not built thru countless hours of sit ups, your biceps are “beach” muscles that can be built through training. As a matter of fact, you would be surprised to know how simple it is to build a decent pair of beach guns. What if I told you, you could build some decent guns using only two bicep exercises? That’s right I said only two exercises! Let’s understand the objective of our goal. 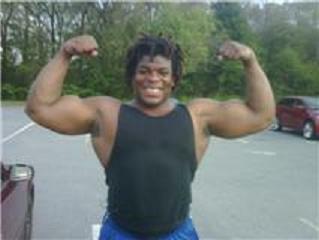 Our goal is to build a big round full set of biceps but remember we are not trying to build Mr. Olympia’s arms. That fact right there cuts down on the need to hit the biceps from a variety of different angles with a variety of different exercises. Another goal of our program is to just keep the program simple. A lot of times during beach season people are either on vacation or constantly on the go. This calls for exercises that you don’t need fancy equipment or specialized machines. While your regular home gym may have the new super bicep curler 8000, the local gym at your vacation spot may barely have dumbbells. Fact is the simplest exercises always seem to do the best job at building muscle mass. While a lot of machines and isolation type exercises have their merit don’t over think things. Dumb things down and keep it simple stupid! For this reason the focus of our two exercises will be using one barbell exercise and one dumbbell exercise. So what two exercises are we going to use? Well if we are aiming to keep things simple but effective why not use the two simplest and effective bicep exercises out there? The barbell and dumbbell curl are going to be our choices. Now before you go “Really that’s it?” We are going to put a slight twist on the two exercises. Barbell curls are going to become “Mighty 28’s” and dumbbell curls are going to become “Thick Grip Hammer Curls”. 1. First thing you want to do is grab a barbell that you can do for 10-12 reps with standard barbell curls. 2. 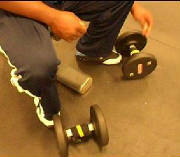 Use a normal grip that you would use for barbell curls and curl the weight half way up for 7 reps.
3. As soon as you finish your seventh rep curl the barbell all the way up. On the way down stop half way. From here on you are going to do your curls starting at the half way point and going all the way to the top. Repeat this for 7 reps.
4. As soon as you complete your seventh rep bring the bar down one quarter of the way and curl it back up to the top. Repeat these for seven reps.
5. Once you complete your seventh rep, bring the bar all the way back down and perform seven full barbell curls for seven reps.
Trust me the pump you will get from these will be even better than doing standard barbell curls or 21’s. The second weapon in our bicep attack will be the thick grip hammer curl. Hammer curls are known for adding thickness to the biceps but thick grip hammer curls do an even better job. Thick grip hammers work your biceps even more by forcing you to contract the biceps harder in order to hold the dumbbell. Another benefit is that they builds your grip, and forearms as well. Over time the stronger your forearms become the more weight you will be able to curl with your biceps. Thick grip hammer curls are exactly as they sound like…hammer curls using some method to thicken the grip. There are a couple of options a person can use to thicken the grip. The first option is to buy some gripping apparatuses that can attach to the dumbbells. 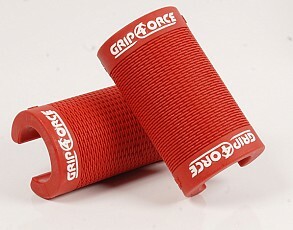 There are a few companies that make these grippers. A little online search and you can find a company that makes theses at a pretty good price. Another method that I find that works well is using a pair of Velcro wrist wraps. Simply wrap the wrist wraps around the handles and the Velcro will hold them in place. This way works pretty well and is pretty cost efficient to boot. Another cost effective way though is just to get a couple of small face clothes and wrap them around the dumbbell handles. This method may not be as secure as the grippers or even the wraps but it does still work, although I would just suggest spending a few bucks, at least on the wrist wrap method. Once you finally have your gripping method under control, it simply is a matter of performing a few sets of hammer curls. The actual workout is fairly simple. It consists of 2 sets of Mighty 28’s followed by 3 sets of Thick Grip Hammer Curls. Even though it is only two bicep exercises you should really go in with the mindset to put a pounding on your bis. It is not the number of exercises but the intensity you put into those exercises. Each exercise should begin with a light warm up set before beginning your actual working sets. While it does not seem like a lot the program is pretty effective. I find one of the biggest problem people run into when trying to build their biceps is that they tend to do too much! Slaving away at your biceps for hours will not make them grow but simply over-train them. Another thing to note is the one tricep exercise of your choice in the program. Just pick one tricep exercise that you like and do a few high rep sets. Here you have freedom to get creative and can stick with the same tricep exercise or change exercises from workout to workout. The main idea is just pumping a lot of blood in that area. You would be surprised how pumping blood into the triceps will help not only bicep growth but total arm growth. The workout can be performed twice a week every 5 days. If you performed the program on a Monday, then give yourself about three days rest in between and perform it again on a Friday. Stick with the program for about 4-6 weeks and then take a few weeks off from the program. If you want to add a little size to your bi’s for the beach, it doesn’t have to be a long grueling bout of bicep blasting. All it really takes is a couple of bicep exercises a couple times a week. Focus and work really hard and you’ll be sporting some of the best biceps on the beach in no time!